The Bathway tub conversion process increases bathroom safety & costs thousands less than other options. Tub to Shower. In Just Over an Hour! Bathway's bathtub to shower conversion process transforms existing bathtubs into safe and accessible walk-in showers. Step in Safely! Keep your mind on your day and away from worry. Bathway's full tub to shower conversions greatly increase bathroom safety. Stay Safe and Contact Bathway! We are Canadian and proud of it! We've been in business since 2006 helping Canadians with their bathroom safety needs. Bathway - The Tub Cutting People: Tub To Shower Conversions In Just Over An Hour! Bathway's bathtub to shower conversion process transforms your existing bathtub into a safe and accessible bathtub or walk-in shower in just over an hour. Bathway - The Tub Cutting People, have been providing accessible bathtub conversions, step in showers, bathtub cutouts and other bathroom safety solutions for retirement homes and seniors in their own homes in Canada since 2006. Falls are a leading cause of hospitalization among seniors, and the bathroom represents a particularly dangerous environment with hard, wet and potentially slippery surfaces. Our specialty is our unique tub to shower conversion process that involves cutting a section out of the wall of your existing bathtub to create a safe and accessible bathtub & walk-in shower. 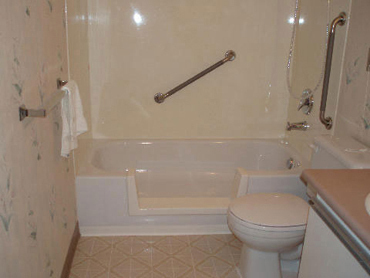 Let Bathway handle your tub to shower conversion process! Accessible bathtubs, bathtub conversion kits, and step in showers from Bathway is your best solution for bathroom safety. Our tub to shower conversion process is fast, affordable, and works on just about any bathtub. We simply cut out a section of your existing bathtub and install a custom fit threshold allowing you to easily step through, instead of over, the bathtub wall. Start Your Tub To Shower Conversion Today! If you are looking to convert your bathtub into an accessible bathtub or walk in shower Contact us today and get your tub to shower conversion started with a free quote, or to request more information about our accessible bathtub conversion process. "Wow! A quick and easy installation, with no mess! And at a fraction of the cost of other options we researched. Thanks Bathway!"